Designs in Air are a pioneering inflatable design company who create original inflatable sculptures and spectacular installations that have been featured at many major events and exhibitions around the world. Working with a dedicated team of specialist machinists, riggers and technicians the company love to create large inflatable displays in diverse locations. Most of the sculptures seen on this website are available for hire or sale and the team can work with you to bring your bespoke concepts into reality. 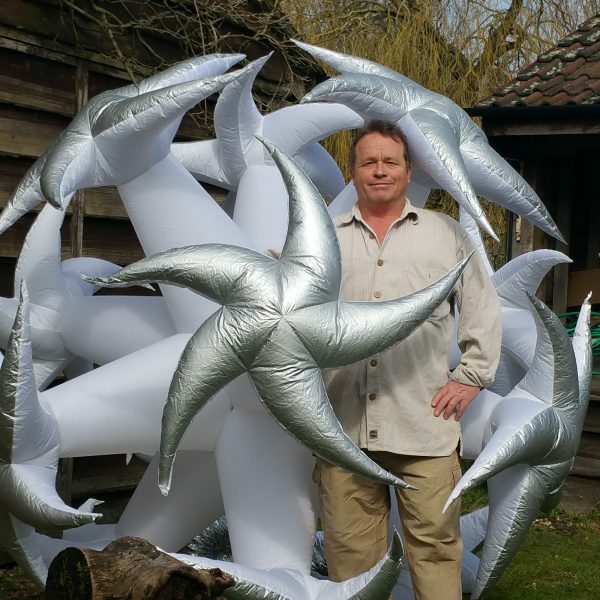 Designer Pete Hamilton began making inflatable sculptures after a happy accident with a hair dryer and a bag of scrap hot air balloon cloth in 1994. Realizing that he was on to something special he immersed himself in the medium and launched a series of spiky sculptures that could be hung up at events. 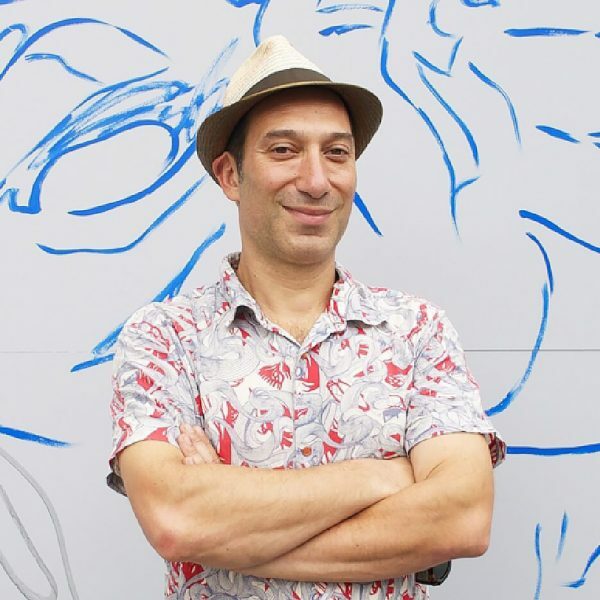 His fascinating geometric creations, in particular his self-illuminating stars made Pete’s company, Star Virus a highly sought sensation in the emerging night-club culture of the era. Artist Luke Egan happened to be creating prints and mixed media sculptures in the same open plan workshop as Pete in 1996. Attracted by the medium and with experience in sewing and textiles, Luke was invited to collaborate. Both were inspired by the seemingly endless possibilities of form and function of the medium. The pair bounced ideas off each other, experimenting with new techniques and applications, from lighting sculptures to bouncy party seating to floating projection screens and pods you could go inside. Using only maths and an artistic eye to design their patterns, the duo meticulously stitched their own sculptures on industrial sewing machines and installed them at the events too. The pieces were made with passion, excitement and an ever deepening understanding of the inflatable medium. Over the years they mastered their craft through their dedication and endless creativity, honing their techniques and refining their skills. They began to use 3D design software to create their sculptures and as the company grew they brought in talented technicians to keep up with all the sewing, upscale their rigging applications and develop lighting. We are passionate about the beauty and magic of the inflatable medium and strive for excellence with every creation. As pioneers of inflatable design for over 20 years, their unique artistic approach and originality has gained the company global recognition and their larger-than-life installations never fail to capture the public’s imagination. With their talented team, Designs in Air have produced hundreds sculptures that incorporate innovative lighting, sensor-based interactive technology, kinetics and installation techniques. Over the years the team have produced many acclaimed works for shows and events with clients such as the 2012 Olympics, The Eden Project and Cirque du Soleil as well as providing environment enhancing decor for parties and nightclubs around the globe and attention-grabbing publicity stunts for clients such as Dyson and Greenpeace. The company is regularly featured with their large-scale displays at international music festivals such as Fuji Rock festival in Japan, Lollapalooza in the USA and Glastonbury Festival in the UK. In around 2004 the art duo decided to bring some of their surreal sculptures into the ‘real world’. Inspired by the new international Street Art movement, and just wanting to “have some fun” with their talents, the artists inadvertently found themselves making their mark and carving out a unique niche with their outlandish urban installations under the alias Filthy Luker and Pedro Estrellas. This often humourous series of artworks, has greatly widened their audience and opened new avenues to the company who now travel the planet installing giant eyeballs in trees and huge cartoon tentacles from windows of skyscrapers in cities around the world. Aside from all this, the company are also very proud to have collaborated with life-hacker and inventor, Lex Cousins in developing a cutting-edge music-making inflatable called Musii, which stands for Multi-Sensory Interactive Inflatable and is a therapeutic product for people with special needs, which is truly changing peoples lives. Inflatable art for hire and commission. Designs in Air create unique inflatable sculptures and spectacular installations. Inflatable street art. Filthy Luker and Pedro Estrellas have been creating bizarre inflatable art since the early 90’s. Interactive music system designed for developmental play and multi sensory therapy. Please contact us for more information.